Have you ever eaten banana bread that was dry, or maybe it starts out good when it's warm but by the next day it's gotten hard? And don't even get me started on banana bread mixes – that's just wrong! Everyone should be able to turn overripe bananas into moist and tasty banana bread with a just a few ingredients that should be found in any well stocked pantry. (If you need a gluten free banana bread recipe with no refined sugar, we've got you covered, too.) And with this recipe, we've got a couple of “secret ingredients” that add a little extra flavor and help keep it moist and tender. My youngest loves this one. 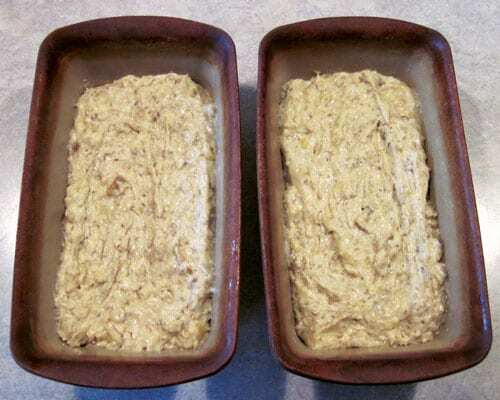 Preheat oven to 350 and prep two 8×4 or 9×5 loaf pans. The pans I use are stoneware pans, and I rub them down with lard and put a strip of parchment in the bottom to avoid sticking. You could also use butter or coconut oil if you prefer. *For the milk in this recipe, you have several options. What you are looking for is enough acidity to activate the leavening agents (primarily the baking soda). To sour pasteurized milk or fresh raw milk, add 2 teaspoons of apple cider vinegar to the 2/3 cup milk (at room temperature), and allow to stand for five minutes. Alternatively, you can use raw milk that has naturally soured. Do not use pasteurized milk that has gone bad. It rots instead of souring. If you have buttermilk or milk kefir available, feel free to substitute either. They will also work well. Using soured or cultured milk is one of the “tricks” that set this bread apart from other recipes I've tried. You can also use this trick in recipes that call for buttermilk. If you don't have buttermilk on hand, substitute soured milk or milk kefir. Cream together butter and sugar in a large bowl. Add in soured milk (or buttermilk or milk kefir) and smashed bananas and mix until smooth. You could mix all your dry ingredients together in another bowl and then dump them into the wet ingredients, but I confess, I never bother. Instead, I add the flour, and then sprinkle the flax, the baking powder, the baking soda and the salt over the top of the flour. Once all the dry ingredients are in the bowl, then I mix everything together until just blended. Mix in nuts or coconut if desired – or – wait until batter is in the pans and sprinkle some nuts or coconut on top. Pour into two loaf pans. Bake for around 45 to 50 minutes, until a toothpick inserted in the center of the loaf comes out clean. The flax is our second somewhat unusual ingredient. 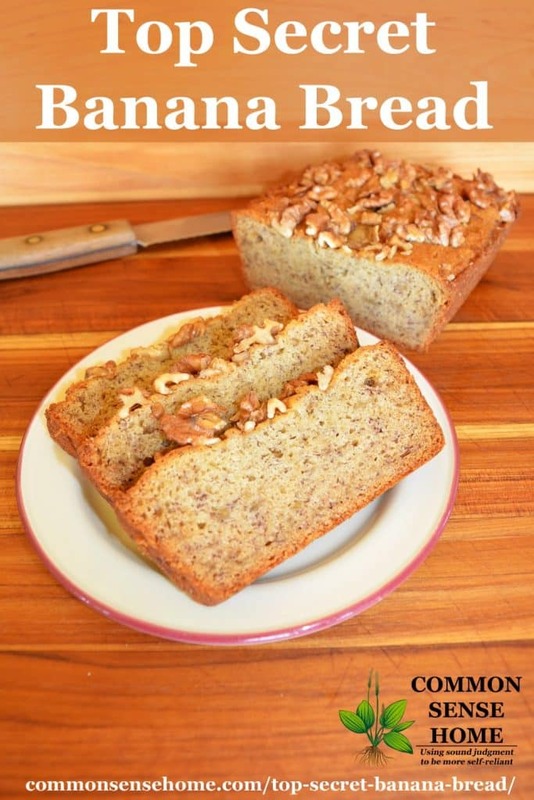 It adds a subtle nutty flavor to the banana bread, even if you don't add nuts. My youngest is not a big fan of nuts, so I often make one loaf with and one without nuts. By sprinkling them on top of the loaves, it's easy to see which is which. I have also used Namaste Gluten Free Flour blend in this recipe with good results. And that's all there is to it. I store in a sealed container at room temp for several days, or frozen, well wrapped, for longer storage. 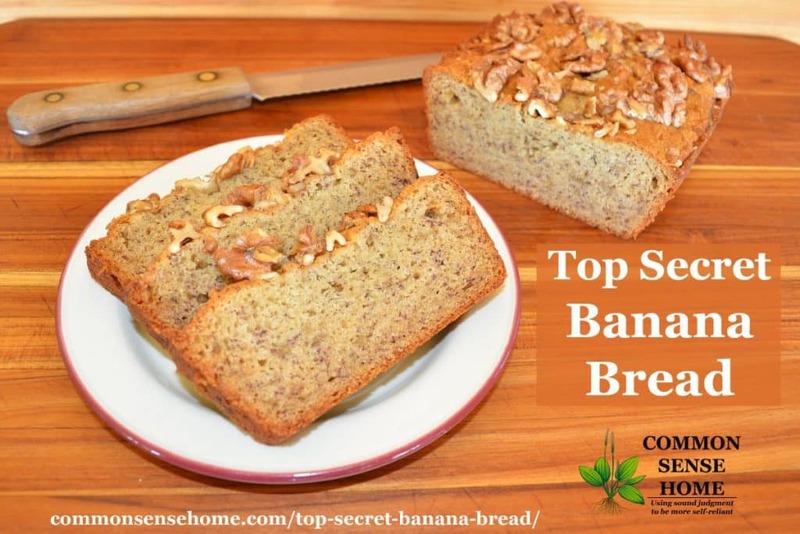 Moist and delicious homemade banana bread recipe with two “secret” ingredients that give it great flavor and texture – not dry and crumbly! 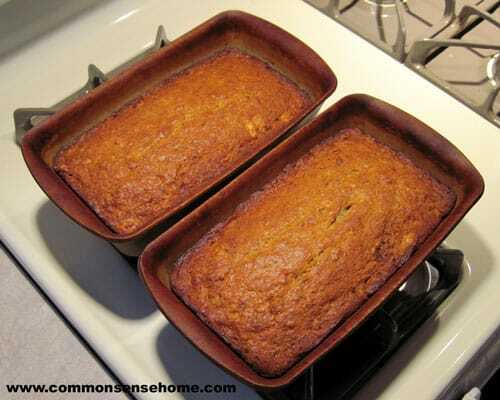 Preheat oven to 350 and grease two 8×4 or 9×5 loaf pans. Add the flour, and then sprinkle the flax, the baking powder, the baking soda and the salt over the top of the flour. Once all the dry ingredients are in the bowl, then I mix everything together until just blended. Mix in nuts or coconut if desired – or – wait until batter is in the pans and sprinkle some nuts or coconut on top. Pour into two loaf pans. *For the milk in this recipe, you have several options. What you are looking for is enough acidity to activate the leavening agents (primarily the baking soda). To sour pasteurized milk or fresh raw milk, add 2 teaspoons of apple cider vinegar to the 2/3 cup milk (at room temperature), and allow to stand for five minutes. Alternatively, you can use raw milk that has naturally soured. Do not use pasteurized milk that has gone bad. It rots instead of souring. If you have buttermilk or milk kefir available, feel free to substitute either. They will also work well. Using soured or cultured milk is one of the “tricks” that set this bread apart from other recipes I’ve tried. You can also use this trick in recipes that call for buttermilk. If you don’t have buttermilk on hand, substitute soured milk or milk kefir. Remove from oven and transfer to a cooling rack to cool completely. Store in a sealed container for up to one week, or freeze for longer storage. Originally published 2013, updated 2016. 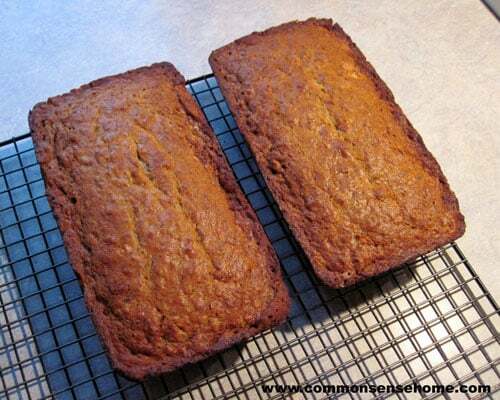 Oh, man this banana bread looks so yummy…and guess who just happens to have a few overripe bananas! Thank you! No eggs. The sour milk adds the fat and richness that would come from eggs in many recipes.